A trade show is a big investment for a company and it is also taking a big chance that the investment will pay off with buyers and new life time customers. Trade shows are usually full of buyers, but they can also be filled with competition and distractions. Today, we are offering up some tips to help ensure that your trade show investment brings in an excellent return on your investment. Think about the situation from the buyer’s point of view. Getting into their heads can help you cater to their needs. If it is a big trade show, perhaps offering up a chair or refreshments will help to ensure they stop by your booth. Are most of the buyers from out of town? Offer up local tips and maps. Think about what attendees need most and have that available for them. It is also important to remember that most trade show attendees are probably not used to walking around so much, even it it isn’t a large trade show floor, they might appreciate a break or maybe a promotional bag to carry all the catalogs and other things they pick up throughout the day. Buyers see a lot of booths and need a reason to stop at yours. 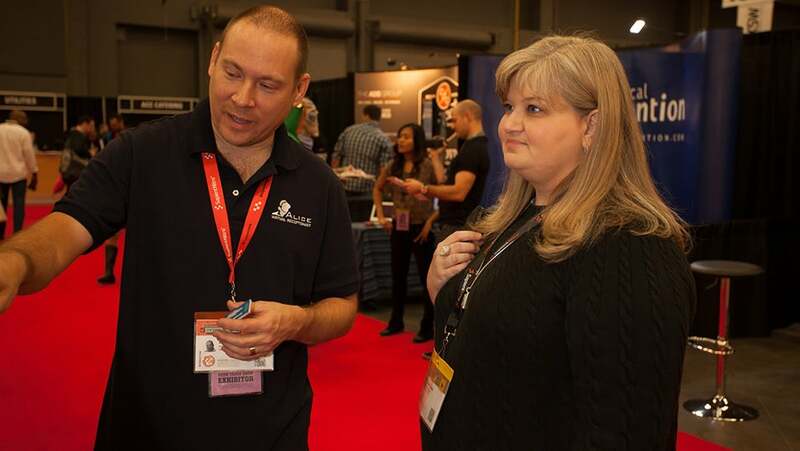 The best way to get qualified buyers to stop by your booth is to let them know right off the bat what your company does and why they should stop at your booth. Signage is important and other visuals like a video help provide passers-by the information necessary to entice them. The decision to stop at a booth is a split second decision. A convincing trade show booth is informative and professional. Uniform staff and an organized booth also factor into the decision for a buyer to stop at the booth. An attractive trade show booth makes a great first impression, but the right information turns browsers into buyers. Let your current and potential customers know about the trade show and that you will be there. Invite them to come and give them an incentive to attend. Look for potential local customers to invite as well. Tap into your contacts and your email newsletter list and send out a personalized message inviting them to attend. Let them know about trade show specials that you will be offering just at the show. You can also send a coupon or give a code to mention for a special gift. Keep special promotional gifts just for special invite customers. This will make them feel special since they aren’t getting the basic promotional product you are giving out to regular attendees. You can also have a higher tier promotional product that you give out with a purchase to incentivize higher sales. Which Promotional Products Work Best? Promotional products go hand in hand with trade shows. Most attendees actually expect to receive something when they visit each booth. Branded gifts have been proven to work well to keep your company top of mind, instill good will, and increase sales. However, the success of a promotional product campaign depends on choosing the right promotional product to give away. So what is the “right” product? It depends on your company because it should be relevant to your company. In other words, if you sell pet products, it could be a branded pet toy or a promotional product that pet owners would use such as a leash or food bowl. If you sell electronics, a branded USB drive or device case would be ideal. If the first rule of promotional products that really work is relevance, the second rule is that they are useful to the recipient. It has to be something that is appreciated and will be used not just for the trade show, but for a longer period of time after they bring it back home or to their office. Research shows that useful promotional products can be kept for 1 to 3 years. Popular promotional products for trade shows include pens, note pads, bags, water bottles, USB drives, and clothing or hats. The right promotional product will not only attract buyers to your booth, but will also help increase your branding and keep your company top of mind long after the show is over. You might consider offering one type of promotional product to attract attendees and give away to everyone and then a second, deluxe branded gift to give away with a purchase. Often times, this can be an incentive for attendees to buy at the trade show. As with any type of marketing or advertising initiative, it is important to test different things to see what works for your company. What works for one company might not work for another; or something might work great for your company based on your products or services and your customer base. Our 4 tips today for attracting buyers to your trade show booth include getting in the mind of attendees, providing information at a glance with a professional looking booth, inviting current customers and potential to attend, and finding the right type of promotional product to give away that is relevant to your brand and useful to recipients.